Carter Sande wanted to learn how to program, and couldn’t find any good books just for kids. So Carter and his dad wrote “Hello World! 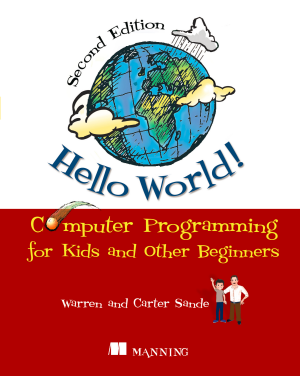 Computer Programming for Kids and Other Beginners”. Carter not only co-wrote the book, he’s in it. His questions and comments guide readers through each engaging, fully-illustrated lesson. Along the way, Carter introduces a cast of characters that include a hip female coder who tells you how to “think like a programmer,” a ninja granny who remembers how it was in the good old days, and even the occasional pirate. Arrrghhh! This book is a hands-on adventure. There’s code on nearly every page, with comments pointing out the interesting and important features. The reader constantly experiments with new ideas and programming concepts. Notes, tips, and definitions appear throughout the book, along with screen images so young programmers can check their work as they go along. And just because it’s for kids doesn’t mean it’s dumbed down. Hello World! uses the Python language. It teaches good programming practice with examples ranging from simple concepts like displaying text all the way through graphics, games, and more. The concepts in the book apply to nearly any programming language, not just Python. Carter Sande is a high school student who is passionate about technology. When he’s not fixing his school’s network and helping his classmates recover lost homework, he likes to ride his bike and write retro video games. Warren Sande is an electronic systems engineer who uses Python both as a “do anything” scripting language and as a way to teach computers and programming.